Jenna Cee has been writing professionally since 2006. Her articles appear on 2Athletes.com and Women's Fitness Online. She is a personal trainer certified by the National Academy of Sports Medicine and as a fitness and sports nutritionist through the International Sports Sciences Association. Cee holds a Master of Science in human nutrition from Washington State University. Grapefruit has received exposure as one of the best weight loss fruits. The Grapefruit Diet claims that this citrus is the ultimate fruit to eat if you want to drop pounds and inches, and the American Council on Exercise recommends grapefruit for dieters to lose weight. Despite all the publicity, you might be curious how grapefruit actually affects your blood sugar and insulin levels and how it stacks up in comparison to other fruits. The glycemic index is a useful reference for diabetics and dieters who want to keep their blood sugar levels as stable as possible. When you eat a food that raises your blood sugar, your body releases insulin to clean up, or lower your blood sugar. Insulin promotes fat storage, and you want to prevent this if you are trying to lose weight. The glycemic index ranks foods and beverages on how much they are likely to increase your blood sugar levels. Foods that have high rankings, especially those 70 and over, increase your blood sugar rapidly. Foods that have lower rankings, below 55 -- and particularly foods 25 and lower -- do not significantly affect your blood sugar and insulin levels. Red grapefruit without added sugars or syrups has a very low glycemic index ranking of 25, so the fruit will not significantly increase your blood sugar and insulin levels. Some red grapefruit is sold in convenient fruit cups but is preserved in a high-sugar syrup that increases the glycemic index. Fresh red grapefruit has a lower glycemic index ranking than almost any other fruit, according to Harvard Medical School. Apples, oranges, peaches, pears, bananas, watermelon and grapes all have a greater potential effect on your blood sugar. 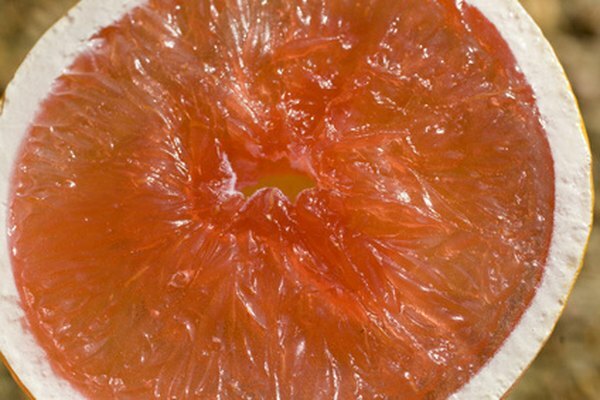 Clinical nutrition specialist Jonny Bowden explains in his book "The 150 Healthiest Foods on Earth" that red grapefruit is more nutritious than white grapefruit. White grapefruit has more sugars, fewer cardiovascular benefits and fewer antioxidants than red grapefruit. A 2006 Israeli study published in the "Journal of Agricultural and Food Chemistry" reports that red grapefruit can lower blood triglyceride levels if they are high and lower LDL cholesterol. White grapefruit is not thought to have these heart-friendly effects. Fresh grapefruit has a lower glycemic index than fresh grapefruit juice. Unsweetened 100 percent grapefruit juice has a glycemic index of 48, nearly double the glycemic index of a solid red grapefruit. Still, grapefruit juice is among low glycemic foods and beverages that rank below 55. Fruit juices tend to have higher glycemic index rankings than solid fruits because fruit juices do not have as high of a fiber content. If you are trying to control your blood sugar levels and you drink grapefruit juice, make sure it is 100 percent grapefruit juice. Some grapefruit drinks often have added sweeteners such as high-fructose corn syrup that can significantly raise your blood glucose levels.